Believe it or not but there have been three feature films based on the nerdiest game of all, Dungeons & Dragons. Most remember the 2000 flop that featured Marlon Wayans for some reason, and that was followed by two cheap sequels that either were for TV or straight-to-DVD. But Warner Bros. has been developing one of their own for a while now, and after a lengthy legal battle over the rights they announced Rob Letterman (Goosebumps) as the director. Now they're taking the next step by signing Ansel Elgort as the first official cast member. Deadline has the news of Elgort's negotiations to join the film which will be written by David Leslie Johnson (The Conjuring 2) and is described as “a fantasy adventure centering on a warrior and his band of mystical creatures as they embark on a dangerous journey to find a mythical treasure.” So why would audiences be excited over this when they weren't over Warcraft? 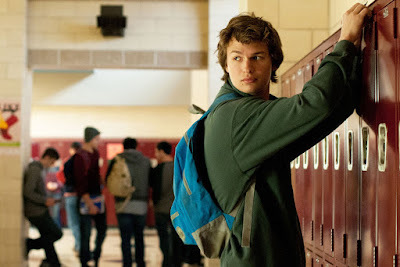 Elgort is a good start, and he's a genuinely likable actor that audiences seem to be responding to. He was great in The Fault In Our Stars and the Carrie remake, and is one of the few bright spots in The Divergent Series. He's currently shooting Edgar Wright's Baby Driver and will be seen later this year in November Criminals, reuniting with Chloe Moretz. No word on what Elgort's role will be or when the film will hit theaters, but after the long wait you can bet Warner Bros. won't wait long. And if they can snag Vin Diesel for a role then that would be even better. Diesel is a longtime D&D player and has been lobbying to be part of it. Now you know why he was so gung-ho for The Last Witch Hunter because it kind of looked like a D&D game come to life, only not as cool.